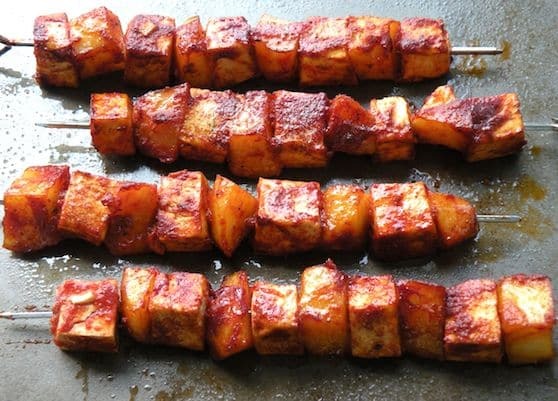 These simple kebabs of tofu and potatoes, threaded onto skewers and slathered with sauce is like an outdoor summer barbecue, all year round. If you use an all-natural brand of barbecue sauce, this is a 3-ingredient recipe. If you make your own, which is highly recommended, it’s not much more time-consuming. Serve with a green veggie (like broccoli or kale) and coleslaw for an easy meal. Bake, microwave, or cook the potatoes in their skins until they can be pierced through but are still nice and firm. Plunge into a bowl of cold water. Or, do this step ahead of time and just allow the potatoes to cool. Once they can be handled, slip the skins off the potatoes and cut them into 3/4″ to 1″ chunks. Drain the tofu and blot very well between layers of paper towel or clean tea towels. Better yet, press for a bit in a tofu press. Preheat the oven’s broiler (or see note, below). When the potatoes are cool enough to handle, cut them into 1-inch chunks. Starting with potato, alternate the potato and tofu chunks on metal skewers. There should be enough for 8 average-length skewers. 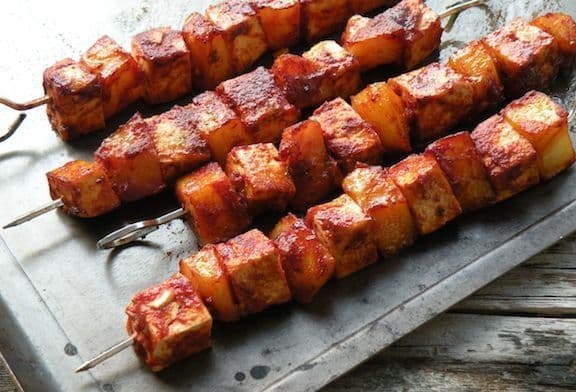 Arrange the skewers on a foil-lined baking sheet (lightly oil the foil or spray with cooking oil spray) and spoon the barbecue sauce generously onto the potato and tofu chunks. Broil for 5 minutes, then turn the skewers very carefully, wearing a long oven mitt. Broil for another 5 minutes. If desired, turn once again and broil for another 5 minutes, or until getting touched with brown spots. At any point, if the potatoes and tofu start looking dry, spoon some more sauce on them. Remove from the oven and serve at once, passing around more sauce, if desired. Note: If you aren’t planning on using the oven for anything else, you can broil half of these at a time in a toaster oven. They will take a bit longer than indicated above. Explore other super-easy 3-ingredient entrées.